On April 11, 1947, Jackie Robinson played his first game with the Brooklyn Dodgers, becoming the first black baseball player to play in the major leagues. A monumental civil rights struggle was undertaken on Robinson’s behalf, in which the left, the Communist Party, the Young Communist League and then Daily Worker sports writer Lester Rodney, played a significant role. 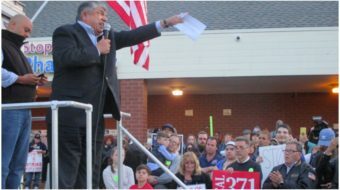 Paul Robeson lent his reputation and voice to the campaign. Robinson had an outstanding career in baseball and won many awards including the Most Valuable Rookie (1947) and Most Valuable Player award (1949). In 1962, Jackie Robinson was inducted into the Baseball Hall of Fame. “Jackie Robinson changed baseball, and when you’ve changed baseball in this country, you’ve changed this country!” Rodney said. Watch for a review or two on Peoplesworld.org. 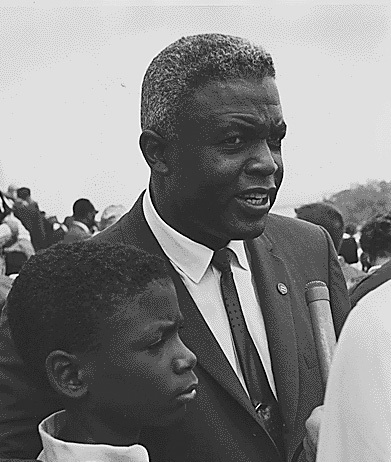 Photo: Jackie Robinson with his son at the August 28 1963 Civil Rights March, Washington, D.C. Wikimedia Commons.